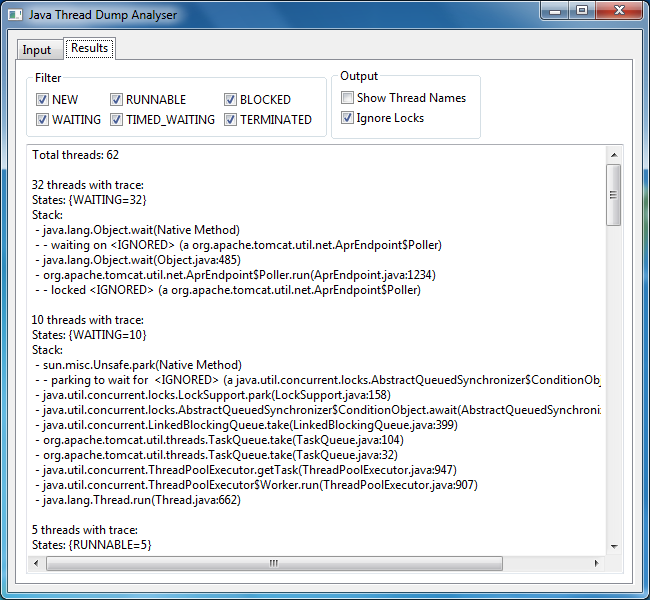 Java Thread Dump Analyser is a tool for quickly summarising lengthy Java thread dumps. News: 25/10/2012: Add command line version. 08/08/2012: Fixes a bug which caused the last thread in a thread dump to be ignored. One of the common types of diagnostics which a Java developer has to look at as a Thread Dump. This lists the stack trace of all the threads in the JVM. However, the generated output can be really tedious to scan through as some applications (e.g. Webapp containers such as Tomcat) can use hundreds of threads, many of which will have the same stack trace as they are idle threads waiting for work. To make it easier to understand the contents of a Java thread dump you can use the Java Thread Dump Analyser. All you have to do is copy/paste your thread dump text into the input tab and press the Analyse button. Here is an example of the output which is generated. - "VM Periodic Task Thread"
- "JMX server connection timeout 68"
jtda-cli.jar can be used at the command line to perform the same thread dump summarization as the GUI.